Enjoy a revitalizing weekend retreat away where you can connect back to nature, bring attention to where you need it most and nourish your mind and body with earthy goodness. 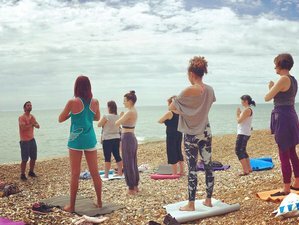 Treat yourself to a healing experience including daily yoga, meditation and mindfulness practices, dietary insight and tips, deliciously nutritious home-cooked meals and surrounding yourself with panoramic country views with nature reserves and coastal beaches nearby. Join us for an inspiring weekend away at our beautiful and warming open planned retreat house located in Faversham, Kent, set in its own private gardens with breathtaking views of Syndale Valley. Your home for the weekend will be held in a beautiful secluded barn house with breathtaking views of Syndale Valley. The house is lovely and bright with an open planned layout. There is a beautiful garden room and terrace to enjoy with spectacular countryside views as well as a log fire to keep you warm and cozy in the living room through the colder months. The yoga and meditation space has plenty of natural light beaming through and incredible views across the fields of sheep and bunny rabbits, during the summer months classes will be outside (weather dependent). The house has a selection of rooms available to choose from, including en-suite bathrooms and balconies with stunning views of the garden or looking out on to Syndale Valley. Amber was born into a holistic & alternative family and has trained in various styles of yoga travelling through the southern & northern parts of India finding her feet. She loves to practice a more stimulating yoga style in the morning to increase energy flow like Ashtanga or Vinyasa and a healing Hatha & Yin practice to wind down in the evening. With every practice she combines the rhythm of breath with movement, being mindful & present, connecting with your true self, bringing awareness to your alignment & healing to where it is needed most. Her classes are down to earth, fun and creative. Ally qualified since 2005 as a holistic & sports therapist and has worked in London for the past five years. She uses a variety of techniques specifically chosen for your person needs weather that be injury rehabilitation, emotional blockages or just a wonderful healing & relaxing massage. With Ally be assured that whatever your reason for therapy she will work with you to find the right treatment to taking the steps towards healing and fixing any problem. Ally truly believes it is essential for absolutely everyone to maintain a balance of body & mind as a regular part of their life. Enjoy daily freshly made juices, wholesome and nutritious vegetarian/vegan meals during your stay with us. Gluten-free diet is available and mostly organic produce used. Prepared with love and care from our inspirational kitchen team! Nearby we have many beautiful beaches and nature reserves including Whitstable, Herne Bay & the magical Blean woods. Enjoy country walks on your doorstep through the orchids reaching to the serenity of Syndale Valley. If you adore bird watching, it is highly recommended to visit the Oare Marshes Nature Reserve. You can relax on the porch with a heartfelt book and a healing herbal tea, or chill in the warmth of the cozy and bright garden room. Surrender to the beautiful scenery that Syndale Valley has to offer. If you really wish to pampered, book yourself in for a healing massage treat and enjoy the use of our aromatherapy Jacuzzi hot tub. 30-minute session for 30 GBP and 60-minute session for 60 GBP. The exclusive use of Jacuzzi hot tub is 10 GBP. Kindly inform the organizer if you would like to book a massage and enjoy exclusive use of the Aromatherapy Jacuzzi during your stay. Please note for guests joining the winter weekend retreats, the hot tub is included. The rest of the payment should be paid 31 days before arrival. Amber Serene E-RYT 500 provides healing & nourishing retreats set in beautiful locations giving you the time to reconnect with your true self. In the event of cancellation by the customer, the following refund fees, minus the 50% non-refundable deposit, apply. The double room ensuite package for 1 person at 495 GBP is available on request.